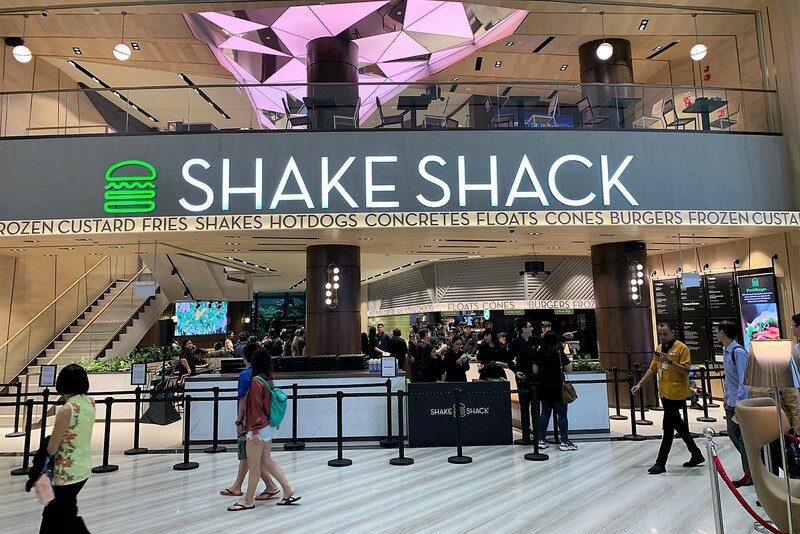 Probably the most anticipated F&B opening at Jewel Changi Airport, famous burger chain Shake Shack has opened its first outlet in Singapore on the 17th of April. 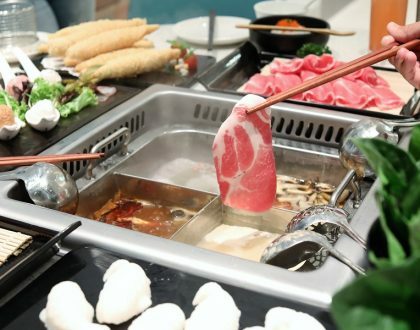 Other high profile openings at Jewel Changi Airport include Burger and Lobster, The Alley 斜角巷, JW360°, Emack & Bolio’s, and Rich and Good Cake Shop. The crowd has been quite overwhelming, with the queue said to be more than 100 metres long, and anticipated wait time of at least 2-3 hours (to even 4 hours). For those who head down during peak hours, you would need to be issued a ticket to be able to queue. 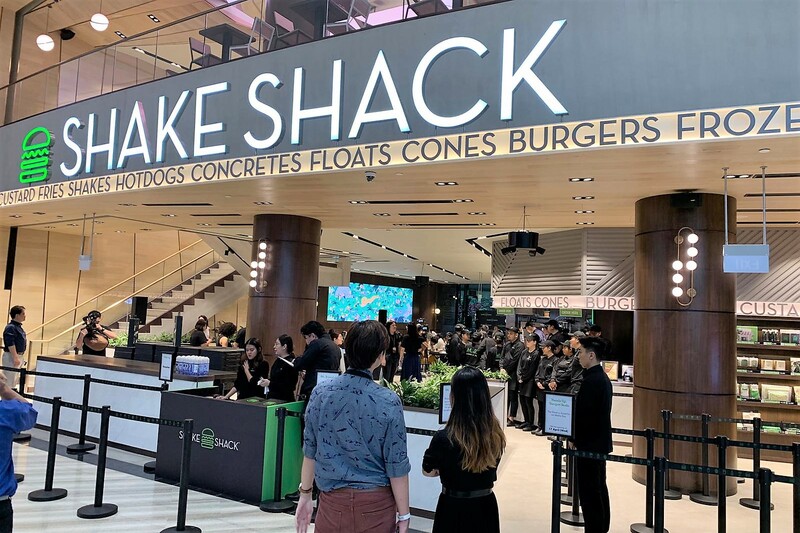 The Singapore menu will feature Shake Shack’s signature items including the ShackBurger, Shack-cago Dog, classic crinkle-cut fries, and frozen custard ice-cream. 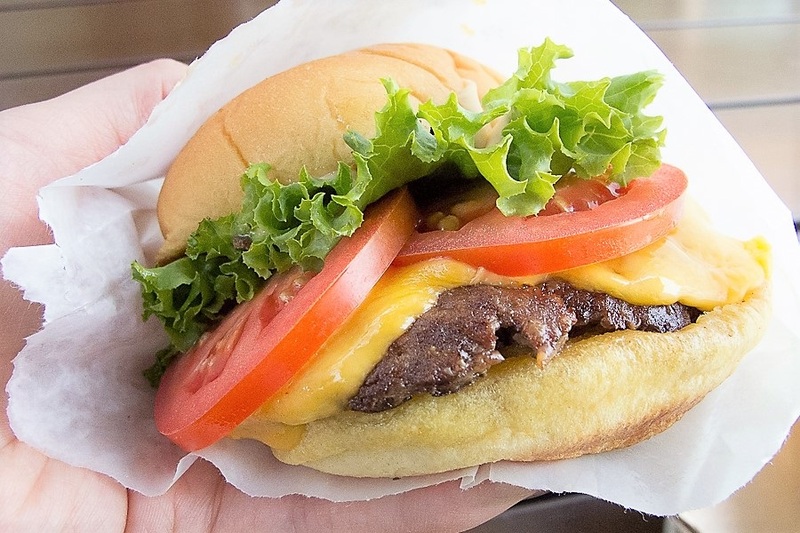 Shake Shack fans call this THE BEST burger in the world (perhaps In-N-Out fans have differing things to say), and the fast-casual restaurant has become an institution of sorts to visit for foodies. Not too bad for this used-to-be humble hot dog cart which started in Madison Square Park. 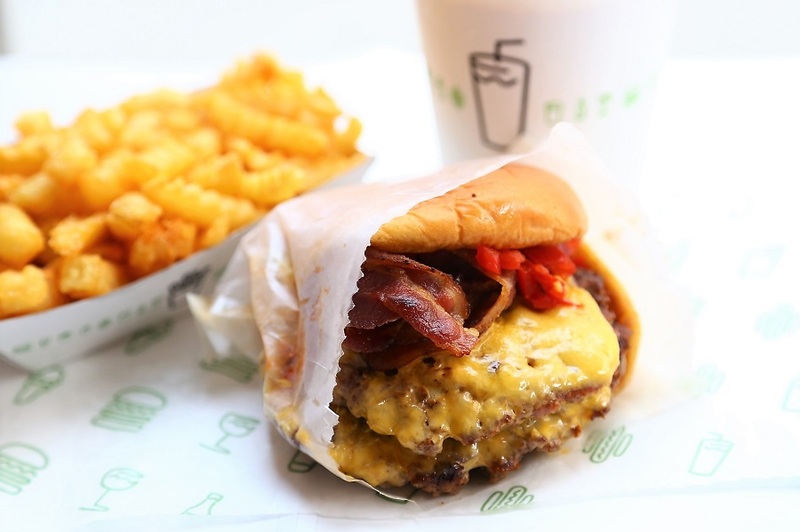 The burger chain was awarded licensing rights to Korean F&B conglomerate SPC Group to set up a Shake Shack in Singapore. 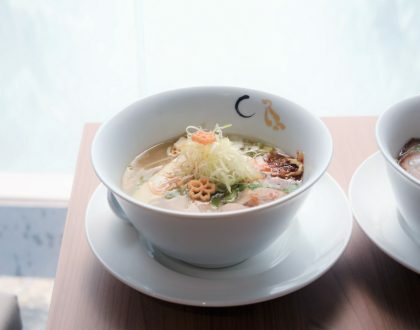 The group is also behind behind bakery brand Paris Baguette, and known for introducing global brands to the Korean market including Baskin Robbins, Dunkin’ Donuts, Caffe Pascucci, LINA’s and Jamba Juice. 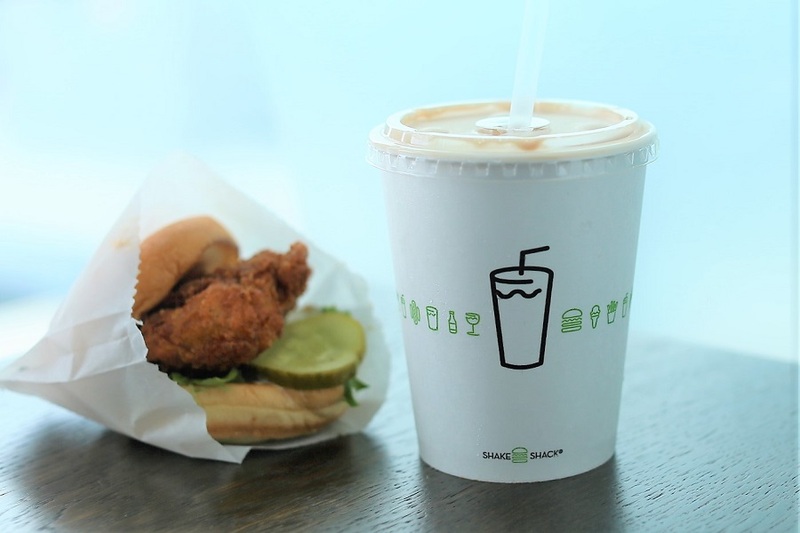 Singapore’s Shake Shack will offer 5 burgers for a start, including ShackBurger, SmokeShack, ‘Shroom Burger, Shack Stack, and Hamburger. Their burgers are known to be made with freshly ground 100% Angus beef – prized for its delicate texture, great taste and no added hormones. People would like the potato roll (aka burger bun) having a pillowy softness and chew that went really well together. 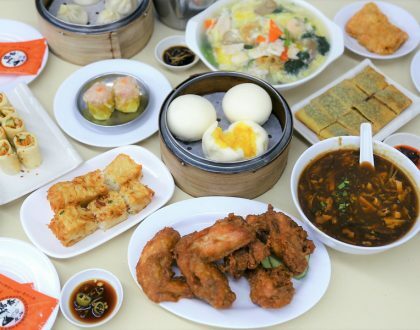 The star is typically the sauce as it would add the extra dimension to the overall taste. (Just FYI, in New York City, it is about USD5.90 for a single Shack Burger = SGD8; 6900 Won in South Korea = SGD8.20; and HKD50 = SGD8.60). For the veggie lovers, the ‘Shroom Burger features a crisp-fried portobello mushroom filled with melted Colby Cheese, Monterey Jack and Tilsite Cheese, topped with lettuce, tomato and ShackSauce, and served on a potato bun. 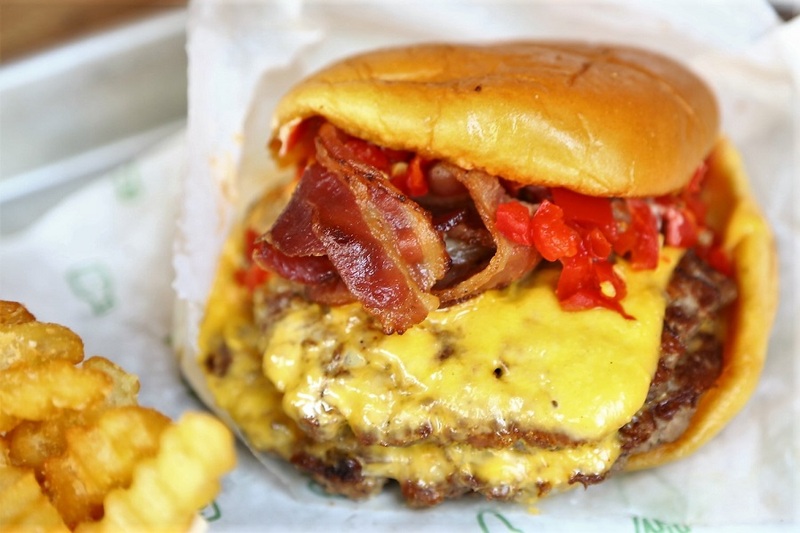 If you are feeling indulgent, get the SmokeShack Double which features applewood smoked bacon, chopped cherry peppers, in a buttered, toasted, soft potato roll. A burger which combines both cheese and shroom burger with lettuce, tomato and ShackSauce. 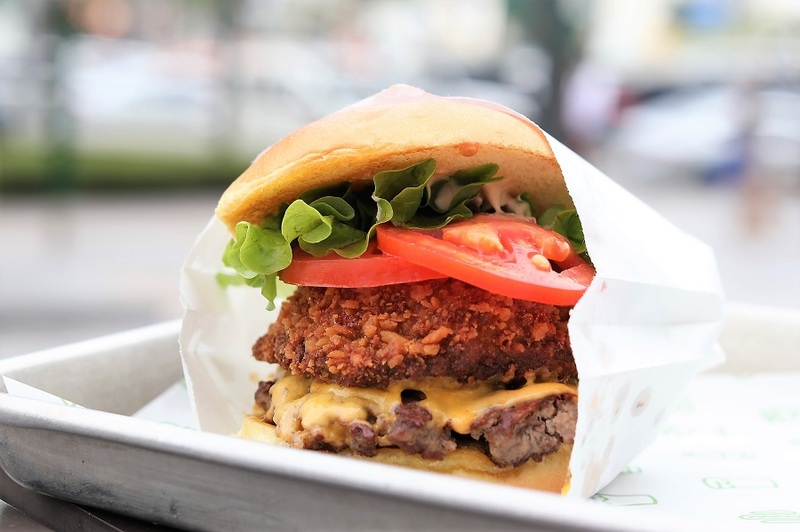 What you get is a combination of crispy-fried portobello mushroom, the signature juicy Angus beef patty, and slice of of cheese, all in one bite. It could be a mess to consume, but I did like the mushroom component for the contrast of crisp outer layer and juicy mushrooms. If you like something crisp and not so soggy, go for the original. 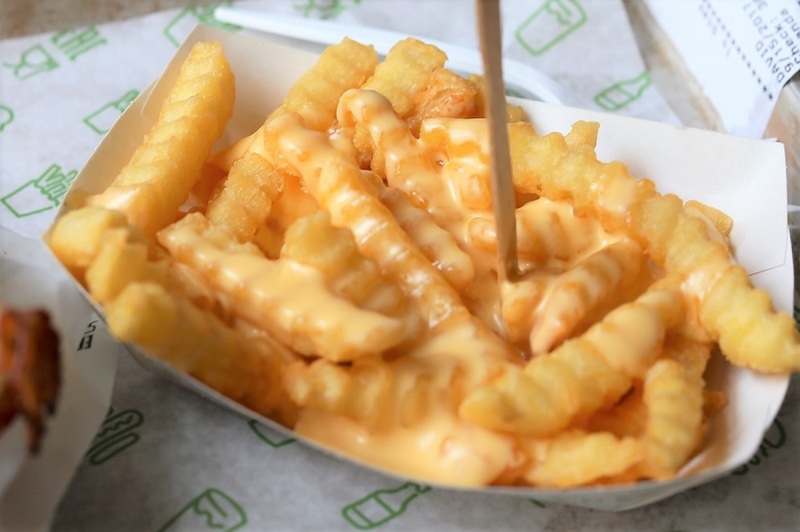 Otherwise, go for the cheese with an addictive cheese coating over. 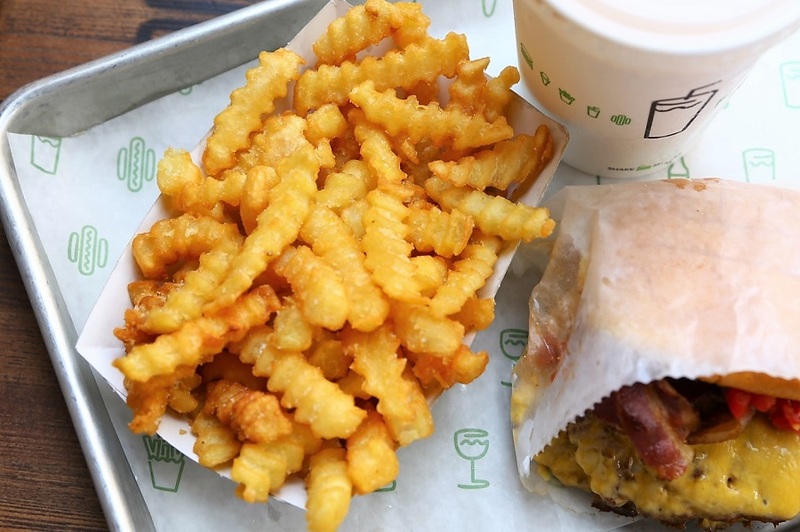 Shake Shack’s frozen custards are said to use use only real sugar, no corn syrup, and milk from dairy farmers who pledge not to use artificial growth hormones. 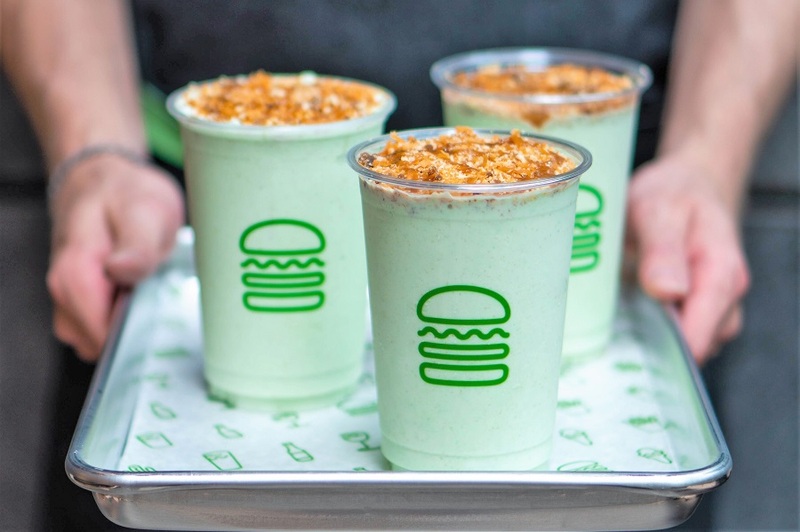 The Singapore exclusive of Pandan Shake, included with vanilla frozen custard blended with pandan, coconut, all topped with Gula Melaka Crumble. Other Shakes flavours include vanilia, chocolate, salted caramel, black & white, strawberry, peanut butter and coffee made with Common Man coffee. 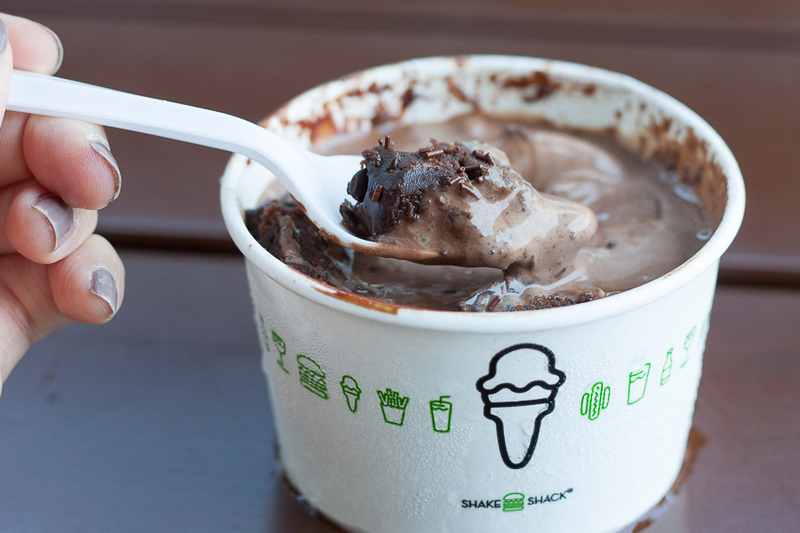 They have a segment under their menu listed as “Concretes”, which are frozen custard blended with different mix-ins. The star item is the Shark Attack, essentially a cup of thick chocolaty ice cream with pieces of brownie in it, and would likely give a sugar high right after the first few mouthfuls. 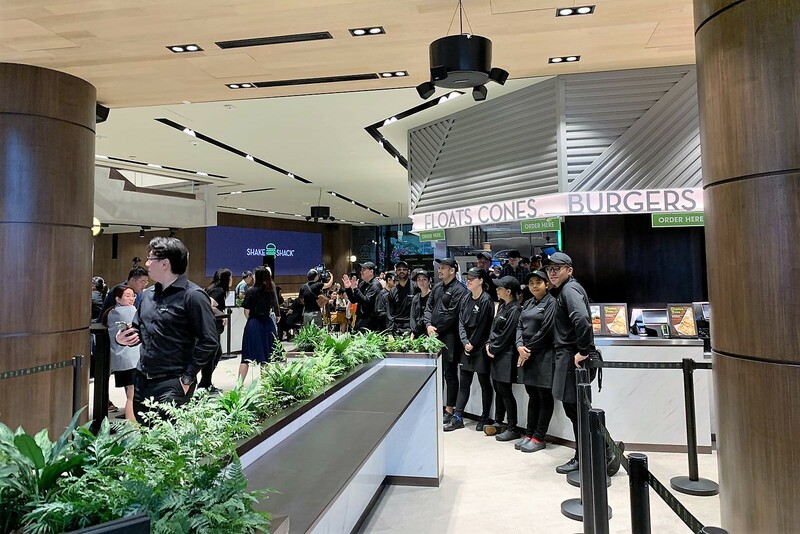 Judging from the queue (and chaos) of A&W during Day 1 of operations, hope that Shake Shack Singapore will be ready for the throng of crowd that would walk through come next week.